We knew these two performance crossovers were coming, and here they are. Even at first glance, the BMW X3 M and X4 M are very clearly differentiated from their sister models, the regular X3 and X4. Unique front and rear bumpers pull them down visually, their massive air intakes are functional, and the non-functional outlet on the front fenders looks sleeker. The mirrors are executed in typical M style, there are pronounced rear spoilers both on the X3 M and the X4 M, and the cars come with standard 20-inch wheels, shod with 255/45 front and 265/45 rear rubber. And 21-inch rims are optional. Next to the front air intakes, the best visual clue that a brand-new, high-performance engine is under the hood are the four exhaust pipes. It's the long-expected 3.0-liter S58 engine, replacing the S55 unit and very loosely based on the B58 modular straight-six. Fitted with a forged crankshaft and a closed-deck crankcase, it is a remarkably sturdy engine, designed to operate at high loads and pressures. Compared to the B58, the M division has increased the bore and shortened the stroke on the S58. The result is a redline of 7,300 rpm, unusually high for a (twin-) turbocharged engine. At market launch, BMW offers two power levels on the X3 M and X4 M: The base versions produce 473 horsepower from 5,600 to 7,300 rpm and 442 lb-ft of torque from 2,600 to 5,500 rpm. The upmarket Competition models make 503 horsepower from 5,950 to 7,300 rpm and produce the same 442 lb-ft on a larger plateau that stretches from 2,600 to 5,950 rpm. The single-scroll turbochargers are identical, but the boost pressure is higher with the Competition models. And M GmbH product planning director Carsten Pries says you can very clearly feel the difference behind the wheel. Performance is ultra-high, with all models governed at 155 mph in standard guise but having the option to raise the governor to 174 mph on the regular models and 177 mph on the Competition models. The sprint from 0 to 60 mph takes 4.1 seconds, or 4.0 for the Competition versions. Clearly, the difference between the versions will only really come out at triple-digit velocities. The straight-line performance is especially noteworthy since these cars aren't exactly light: The X3 M tips the scales at 4,620 pounds, and the X4 M is only marginally lighter at 4,590. The power is transmitted through a ZF-supplied eight-speed M8HP75 transmission; the sixth gear represents direct drive. While the all-wheel drive system is taken from the M5 almost unchanged, it lacks the rear-wheel-drive-only setting of the V8-powered sedan. Carsten Pries says that a rear-wheel-drive option wouldn't sit well with the philosophy of BMW's X models. But fret not: Rear-biased by default, it can be further sharpened in order to let the driver go sideways to his heart's content. Stopping is made easy thanks to a high-performance braking system with four-piston calipers on the front wheels and single pistons on the rear. There are no carbon-ceramic brakes, as M GmbH has recognized that their X-model customers like to go fast but don't necessarily take their car to the racetrack. Specifically-tuned, electronically controlled M adaptive suspension with stabilizer bars up front and in the rear, anti-roll bars, struts and braces make for a significantly stiffer body and an even more precise driving experience. The rear-mounted active differential makes these models even more agile, and these M modle also have a specific electric power steering unit. We have described the outside, but these models also shine once you have stepped in. There are M-specific instruments, programmable buttons, specific decor (carbon fiber is available both inside and outside), exclusive stitching and M badges everywhere. The gear selector, and we are thankful for this, can still be used to up- and downshift, in the way God intended: Pull to upshift, push to downshift. Thanks, BMW, for doing the right thing instead of avoiding the controversy by doing away with it altogether (like the Porsche 911). X3 M or X4 M? It's a matter of taste. The X3 M represents an almost perfect disguise, while the X4 M looks rather sporty, not least thanks to the Gurney flap on the tailgate. But there's a clear penalty in cargo space if you go for the X4 instead of the X3. Slated for a U.S. launch on July 13, the X3 M comes in at $69,900, with the Competition model commanding an extra $7,000. 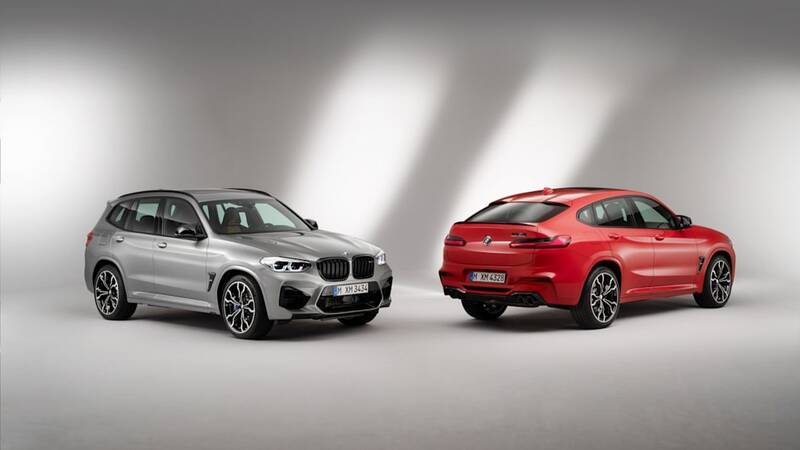 The X4 M is listed at $73,400 and $80,400 respectively. Considering that the 355-horsepower X3 M40i costs $54,650 (and the X4 M40i comes in at $60,450), the 473-horsepower X3 M and X4 M models seem almost a bargain. And they will give the competition something to chew on. The Porsche Macan Turbo, so far, is far less powerful, and the V8-powered Mercedes-AMG GLC 63 is a very different vehicle. In terms of driving character, the imperfect but fascinating Alfa Romeo Stelvio Quadrifoglio may come closest.